Building it Together! 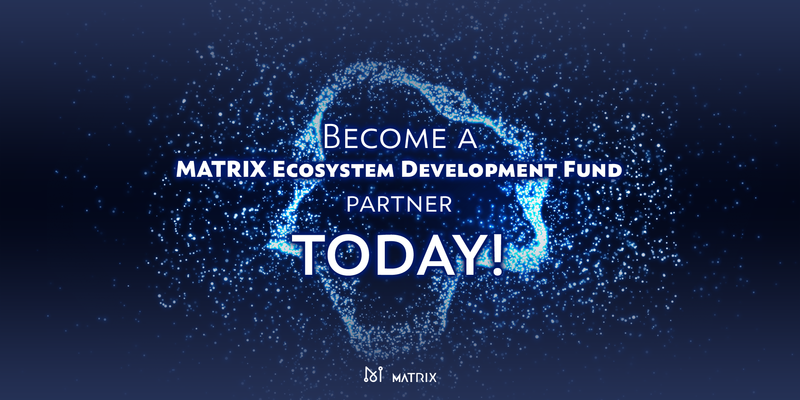 Become a MATRIX EDF Partner Today! The MATRIX AI Network Ecosystem Development Fund applications are open! The MATRIX AI Network was always envisioned as a community effort. In line with this, the team is excited to formally announce the MATRIX Ecosystem Development Fund! The MATRIX Ecosystem Development Fund (EDF) is a communal project designed to align the development of the MATRIX AI Network with the expectations of the community. More specifically, MATRIX will work alongside MATRIX EDF Partners to incubate promising projects. Becoming a MATRIX EDF Partner is simple. To be eligible, you simply need to commit a minimum of 100,000 MAN tokens for 6 months! To apply, simply scan the QR code below (or click this link!) and fill out the form. If approved, the MATRIX AI Network will send you the MATRIX EDF Partner Cooperation Agreement to sign. That’s it! 1. MATRIX will immediately match the MATRIX EDF Partner’s token contributions. The funds will be jointly managed. 2. Any tokens left unused during the 6-month period will receive a 5–12% return depending on the quantity of tokens. 3. MATRIX EDF Partners will prioritize which projects to incubate. 4. MATRIX will cover any losses incurred as a result of incubating projects. 5. MATRIX EDF Partners will receive commissions for successfully introducing projects and organizations to the MATRIX Ecosystem Development Fund. 6. MATRIX will support MATRIX EDF Partners who organize offline activities. Let’s build the MATRIX ecosystem together!